Good tailors for adjustments to suits, trousers and shirts are not always easy to find. There is a raft of pretty poor establishments dotted around London, staffed by dressmakers or general tailors with no specific experience of men’s tailoring. For the last few years I have used a small outfit in Mayfair called Atelier Colpani (on Avery Row, parallel to Bond Street), which is where both Etro and Paul Smith send their customers’ alterations. However, while the work has been excellent Colpani has two chief failings: they are not specifically men’s tailors and they are in the West End, while I work in the City. I was pleased last week, therefore, to find a bespoke tailor nearby that also does alterations: Graham Browne. Based in Well Court, just off Bow Lane and close to Bank tube station, Graham Browne is a tailor established in 1968. Previously of Little Britain (next to St Paul’s) the firm specialises in bespoke but also does alterations – both are very reasonably priced, with bespoke starting at £790 and my adjustment to the waist of a jacket coming in at £20. An inspection of the seams confirmed that it had all been sewn by hand and fully canvassed. The only constructive criticism of Edward was that “perhaps the stitches could be a little closer together for strength.” As I have had the jacket for two years and heavy wear has produced no failed stitches, they seem to be working pretty well (no pun intended). For those interested in Graham Browne’s bespoke work, all the measuring, cutting and pattern making is done on site. The sewing is done by a team in north London. Graham Browne has also been involved in making tweed cycling suits using the innovative material developed by Guy Hills and Kirsty McDougall of Dashing Tweeds. 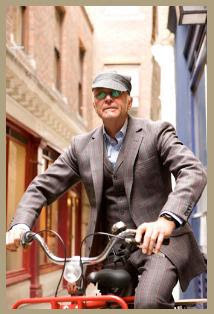 The latest example of a suit in this material can be seen on the Graham Browne website (and is pictured above), a suit for Gary Fisher – the founder of the cycle company of the same name. While I was in the store I also saw a thick shirt-jacket in production. Entirely unlined but of a thick tweedy material, it is affectionately referred to by the staff as their lumberjack shirt. You can follow the discussion on A new (dashing) tailor discovered by entering your email address in the box below. You will then receive an email every time a new comment is added. These will also contain a link to a page where you can stop the alerts, and remove all of your related data from the site. I concur. There are a number of garments in my wardrobe that could use some alterations but I’m a perfectionist too scared of facing dismay as a result of poor craftsmanship by a tailor. It’s a bit like visiting a barber, there is high risk involved and limited near zero room for correction. The only alteration experience I’ve had so far was at Brown. I purchased a pair of Dior Jeans what I wanted a narrowed because of my skinny calves. Then I wanted a pair of my other one size larger Dior Jeans, to match the dimension of the new Jeans. To my surprise Brown’s tailor did a magnificent job with no traces of alteration what so ever. hi simon, i recently bought an off the rack blazer and was advised to have alterations made but to only one sleeve to shorted slightly as the saleman said my arms are different legnths! is this normal? if they are wrong about this would i be able to let that sleeve back out (they are working cuffs on the blazer even though it is RTW)? I’ve been following your blog for a couple of years now and have introduced some of your excellent recommendations into my wardrobe. – the Armani suit jacket has been taken in at the sides order to give it a slimmer silhouette, but it now looks at odds with the width of the arms – which appear more billowous. In your view, is it worth reverting to the original shape in order to save further aggravation with the fit which, for the most part, was good or is it best to press on with AC’s recommendations? I have little experience on how to manage tailors to ensure that we share the same end product vision. In short, when should we cut our losses and move on? Thank you in advance for taking the time to consider this matter. I’m pleased the advice on fit has been helpful. Simon! Buying a RTW option from Drakes or buying a bespoke jacket from Graham Browne where the potential for fit may be greater! Which would you go for?